WASHINGTON—Providing a glimpse into the difficulties of working within the organization during the 2016 presidential campaign, Democratic political strategist Donna Brazile told reporters Thursday that the Hillary Rodham Clinton High Palace Of The Solar Order was almost like a cult. “From the very beginning of the presidential race, the Hillary Rodham Clinton High Palace Of The Solar Order created a kind of insular environment that really didn’t tolerate the questioning of her absolute authority over all beings and things,” said Brazile, adding that the Order was often plagued by a cult-like atmosphere surrounding its anointed leader, especially in Clinton’s edict that she was always to be referred to by a 12-word formal title and the mandatory practice of all members gathering in the sweat lodge to zealously repeat “I’m With Her” for five hours every day. “Things got fairly weird around the primaries, when we had to take a vow of silence, and whenever she left the holy lair, everyone had to bow their heads and avoid looking at her as a sign of divine respect. 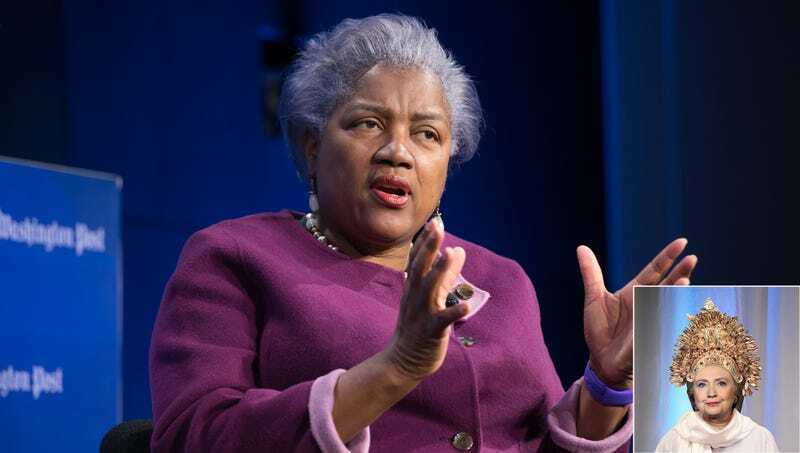 And there was never really any effort within Order to offer dissenting views, especially after Hillary ordered Robby Mook to be shackled and displayed on one of the H altars as a warning to troublemakers.” Several reports indicate that Brazile was last seen being swarmed by a gang of purple-hooded assailants and thrown into the back of an old campaign bus emblazoned with a High Palace Of The Solar Order emblem.